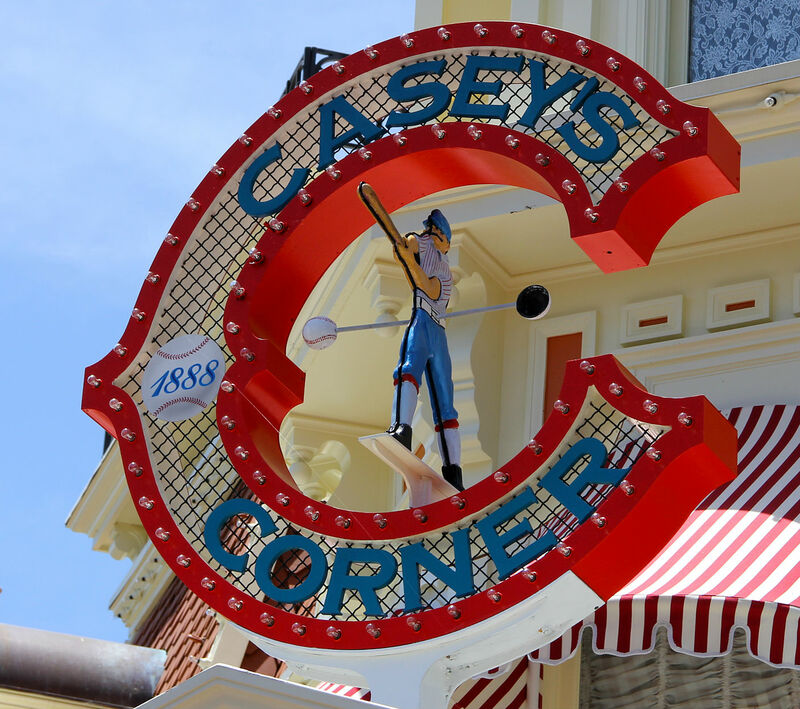 Casey's Corner is practically legendary by Disney standards. It is one of the very few counter service restaurants that I will rave about. It breaks the monotony of the quick service standard, and I am not ashamed to admit that I have gone to Magic Kingdom on more than one occasion specifically and only for a Casey's hot dog. 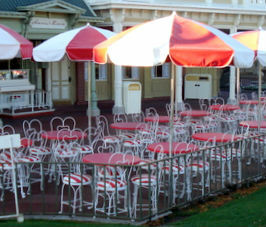 Open for both lunch and dinner, Casey's is located at the end of Main Street USA. They do not accept reservations, but they do participate in the Disney Dining Plan. 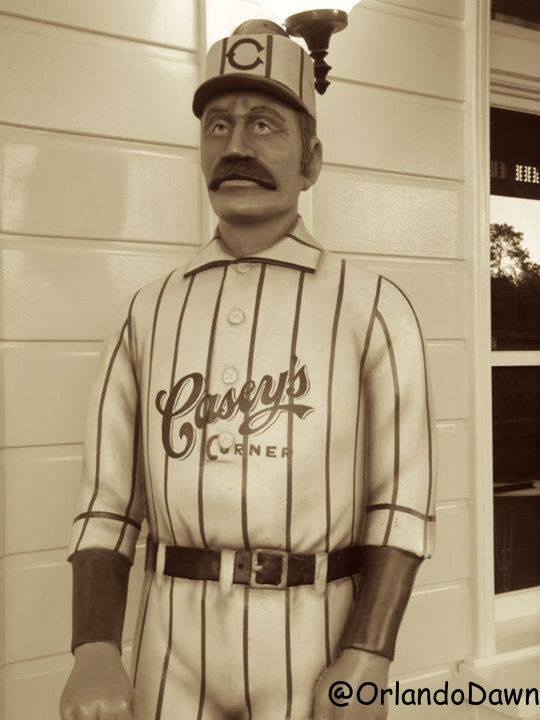 Paying homage to "Casey at the Bat", a poem by Ernest Thayer, Casey's Corner is a throwback tribute to America's favorite past-time - baseball! 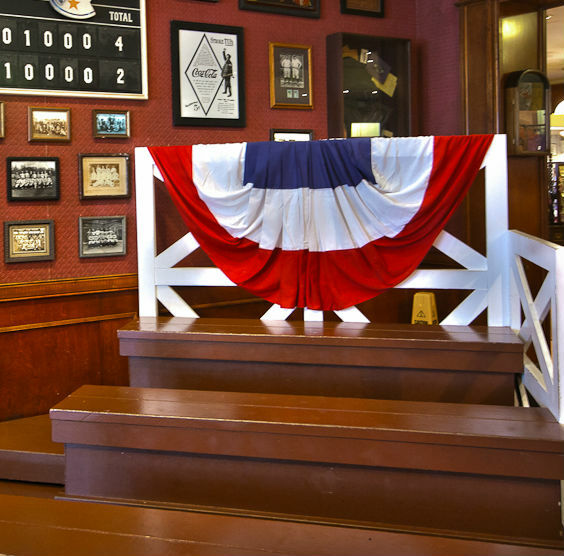 Perhaps I am a bit biased here (aside from Disney, my other lifelong constant is baseball), but in my humble opinion, the details and theming are just brilliant. 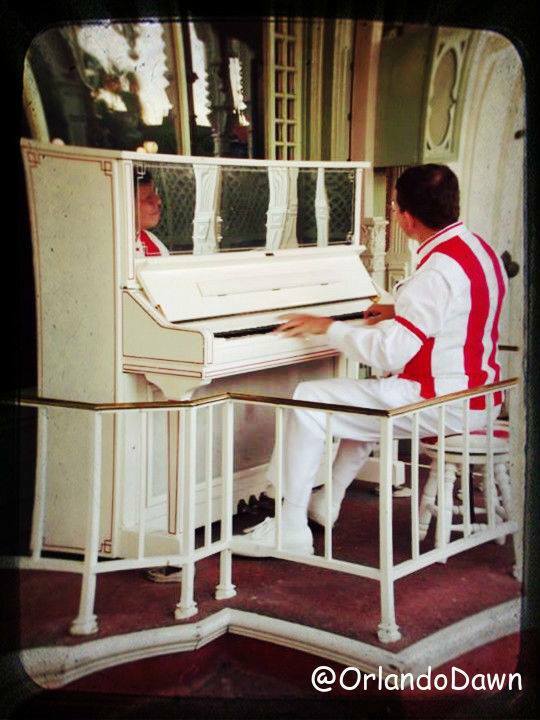 Outside of Casey's, throughout the day, you can catch a lively, fun piano performance as well. In fact, this is a fine place to pull up a chair to enjoy your meal. This is the one drawback to Casey's - seating. There is very (and I do mean very) limited seating inside; a few tables and a small grandstand of bleachers. If you're blessed by a leprechaun, this is a wonderful place to sit as a big screen TV provides entertainment via old Disney sports cartoons, and air conditioning provides relief! The Casey's menu covers the traditional favorites of an American ballpark: nachos, hot dogs, polish sausage, corn dog nuggets, french fries, brownies, cotton candy, and even Cracker Jacks! 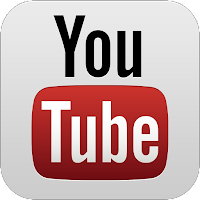 Hot dogs can include chili and cheese (which I highly recommend), pulled pork and cole slaw (bbq style), or opt for a plain dog, and dress it up your way at the condiment bar. Note that items like chili and pork are not available at the condiment bar, but cheese is. Healthy options don't have much of a place at an establishment like Casey's, so don't plan to dine here if you're the type that fears extra calories. This meal may make you feel a tad bit guilty, but it is worth every admonition. Best news is, you can get out of this meal for less than $15 per person - even with a dessert and drink! Overall, your WDW experience is just not complete without a visit to Casey's! *TOP PICK - It really goes without saying that the item of choice here is the hot dog! 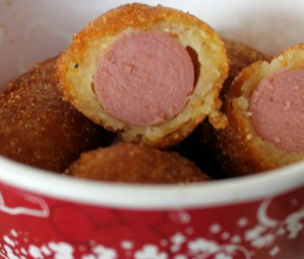 Personally, I'm not even a huge fan of the hot dog in general, but there's just something about this one. Dress it up however you like. A person's hot dog decor is a very personal choice, so have fun! I'm partial to the chili and cheese, myself... topped with a bit of onion. 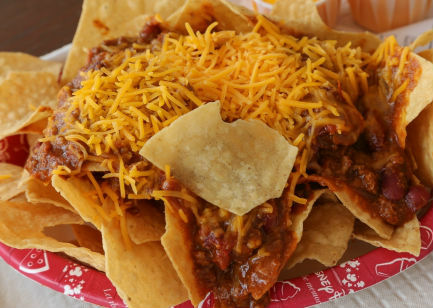 Don't underestimate the yum factor of the nachos as well, and if you top those fries with some cheese (free at the condiment bar), your physician may lecture you, but you won't regret it! 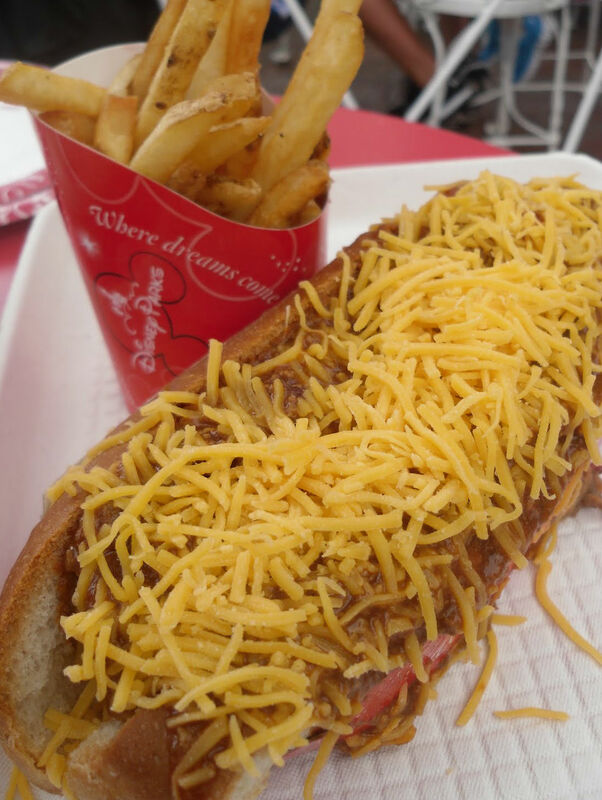 Plain dogs are under $8, or load them up for less than $10 - fries included in those prices! Enjoy a healthy heap of nachos for $8!